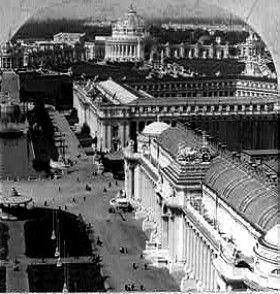 In 1904, St. Louis hosted the World’s Fair, the greatest event in its history. Covering more than 1,000 acres in the vicinity of west Forest Park, the fair attracted more than 20 million visitors to the glittering expanse of white palaces and lagoons. That same summer, the United States became the first English-speaking country to host the Olympic Games on the fairgrounds. 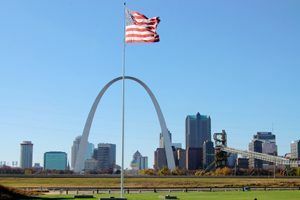 Bringing worldwide attention to the city, another wave of growth continued in St. Louis which lasted through World War I. Though the depression took its toll on St. Louis in much the same manner as other cities, the town bounced back quickly with its wealth of industry and diversification. When Route 66 came through the city, St. Louis was already more than 150 years old, with well established streets and neighborhoods. Due to the city’s continued growth and expansion during the life of the Mother Road, the route was changed in St. Louis multiple times. With so many alignments through the metropolis, you’ll need a few good maps to navigate St. Louis in search of search of vintage Route 66 icons. Start your journey of the Mother Road through Missouri on the Old Chain of Rocks Bridge, located north of downtown. Crossing the Mississippi River, from Illinois to Missouri, the bridge was constructed in 1929 as part of the original Highway 66 project. Initially financed by tolls, the bridge carried passengers over the “Mighty Mo” for the next 38 years until a new bridge was constructed in 1967. Then, for more than three decades , the bridge sat closed and abandoned in an area that soon developed a reputation for crime and violence. However, in 1999, the bridge was renovated and reopened as a bicycle and pedestrian bridge. Today, the one mile long Chain of Rocks Bridge is one of the longest strolling and biking bridges in the world. After viewing this historic viaduct, head to downtown St. Louis where you can see the Gateway Arch National Park with the Museum of Westward Expansion, and the historic Union Station. Before leaving downtown, be sure to grab a bite at the Eat-Rite Diner at 622 Chouteau Avenue. Constructed in 1908 before Route 66 was even conceived of, this long enduring eatery first served as a coffee and donut shop for railroad crews. In 1940, it became the “Eat-Rite Diner” and coined its motto “Eat-Rite or don’t eat at all.” Today, you can get a great burger at its chrome bar that will make you feel as if you have taken a forty year step back in time. Another “must see” along the way is Ted Drewes Frozen Custard at 6726 Chippewa, which has been serving up frozen “concretes” to hungry travelers since 1929. In September of 2016 it won the second annual World Ice Cream Index. 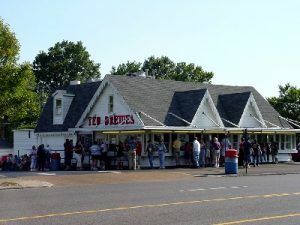 Not far from Ted Drewes is another old Route 66 landmark – the Donut Drive-In, which also continues to cater to Mother Road travelers today. At the National Museum of Transportation in southwest St. Louis, you can view a unit of the Coral Court Motel. Moved brick by brick to the museum, this motel once gained a reputation in St. Louis as a “no-tell motel.” Though the historic motel is gone, the museum brings at least a piece of it back to life. Continue to follow the Route 66 markers along Chippewa and Manchester Roads through the St. Louis suburbs to see numerous vintage motels and diners scattered between busy modern shopping areas.